Stickers, little toys, bits of candy? What can we do to motivate our young learners? It IS more than these types of tangible prizes. We believe that teacher and family excitement is the best way to reward and encourage children. Let your face light up with happiness when a child asks you to read a special book. Jump for joy when a letter of the alphabet is said. 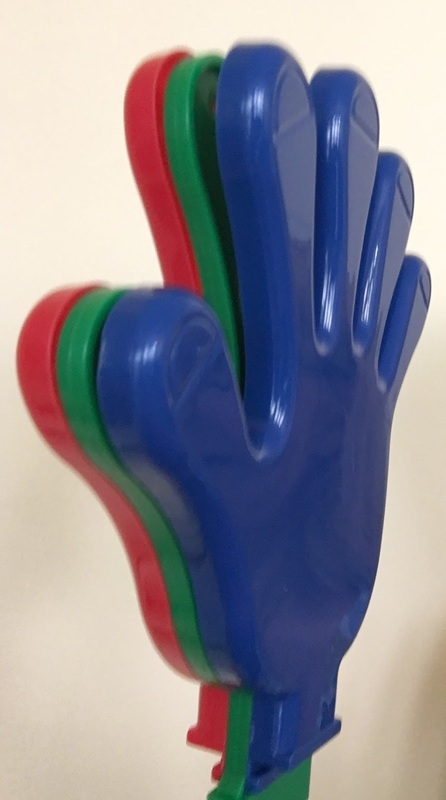 Use tools like a big hand to clap to celebrate something special in the classroom. These all show a child you value his or her successes. Fun "tools" like this, available at party stores, make for excitement in the classroom. Rather than traditional stickers, use the powerful sense of smell. Make a star on a child's hand with invisible chapstick. The sweet odor will remain for several hours and remind your young learner that you valued an accomplishment. Allow children a reward and learning experience at the same time. Give "free passes" to watch real animals in their natural habitats on-line. Websites like Explore.org allow children to view puffins, bears, and even bison. I found letting children see pandas was more powerful than a trip to the prize box. And what fantastic learning takes place, too!